Here is some training advice for your Everest base camp trekking adventure. No matter where your training begins. There are are some key processes you need to go through. The first thing you should do TALK TO IAN. Ian has climbed Everest to the top and make 30+ treks to Everest Base Camp. Let’s think about the trek and the different elements involved in making this journey. Please do not show up on our trips without the right training and preparation. Go to our Everest base camp page. Lets think of this is a few different ways. Firstly look at the daily distances on the trek. Then add the elevation gains on the bigger days of the trek. Factor in the lack of oxygen and you can put a training plan in place. CONTACT US and let us help you figure out how you should be training and getting the right mix of strength and endurance. Read some REVIEWS from our trips. – Covering over 6,000m/ 20,000 feet of ascent and descent during the journey to Everest base camp and back. – On the way down you will be hiking 20+km/ 12.4 miles per day on uneven terrain up and down hills on the longer days of the trek. – All of this will be done at high altitude (Between 2,500m/ 8,202 feet and 5,500m/ 18,000 feet) Extreme altitude is above 5,550m/ 18,00 feet. At extreme altitude nothing lives, survives and will ultimately die. You will be trekking where there is 30% to 50% less oxygen getting to your muscles to help you move, recover and sleep. Check out our Top 10 TIPS for a successful trek. 2). Get our Top Tips for a successful trek. 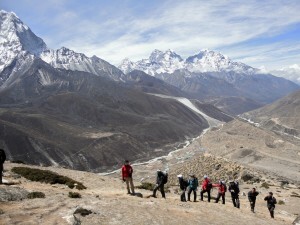 Here is some training advice for Everest base camp treks. 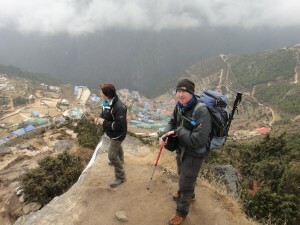 Check out our top 10 tips for Everest base camp treks. I have climbed Everest, Kilimanjaro 27 times, Island peak 10 times and lead 30+ treks to Everest base camp. Distance: CLICK HERE and read the daily distances on our Everest base camp trek. Essentially you need to be able to walk 10 miles a day in your training on a multi day basis with a weighted back pack as you built up to the trek. On the trail you will need to have a proper back pack with waist strap and you will carry 5kg+/ 11lbs+ with a lack of oxygen in your body. 3). How should you be preparing for the trek. When you arrive in Lukla airport at 2,850m/ 9,383 ft. You are entering the realm of high altitude with 20% less oxygen than sea level running through your blood stream and muscles. You have to walk for 9/10 days to reach Everest base camp at 5,364m/ 17,598 ft and climb Kala Phattar at 5,545m/ 18,192 ft. At the end of the trail at Everest base camp there is 50% less oxygen in the air that you are breathing. Then you have to return back to Lukla airport over 3 days and walk long distances. You have to walk 75+ miles return trip from Lukla to Everest. If you want your muscles and body to cover this distance in this environment you need to train and condition your muscles prior to arriving in the Himalaya’s. You need to be getting this muscle conditioning or muscle memory in your body, by walking up and down hills prior to your trek. I like to head out once a week walking 3 – 5 hours up and down hills building the weight in my back pack, building up to 8kg to 12kg (11lbs to 26lbs) over a period of time usually 3 to 5 months before my treks. I also add in 3 to 4 other training sessions per week depending on time available. These will range from 6k to 10k jogs, weight training, walking up hill with weight on a stair master or treadmill. Stair master is best. All training sessions should be used with a weighted back pack. The key is getting active and trying to get as much hill work in as possible. I hike at a slow and steady pace trying to drink a liter of water for each hour of exercise. Let us help you prepare as we know most of you are coming from sea level with limited or no access to hills to training on. 4). Make sure you have the right itinerary. It doesn’t matter how fit or strong you are if you do not have enough acclimatization built in. Altitude: Picking the right itinerary is critical. We have added an extra day to our Everest base camp treks. We spend 3 nights at 3,440m/ 11,286ft at the critical acclimatization point on any altitude journey going above 5,000m/ 16,404 ft. Giving your body time to acclimatize to the low levels of oxygen is critical. This extra day helps you adapt to the low levels of oxygen. Likewise when you are training for this 13/14 day trek to Everest base camp or any Himalayan trekking adventure you need to train in similar terrain where possible. By adding more weight in your back pack at sea level you are making your body work harder and conditioning your muscles for a harder work load when we have a lack of oxygen in the body at high altitude. I hope this makes sense. If not pick up the phone a call us. We can take you through this key training advice for Everest base camp treks. This specific training will help lesson the muscle fatigue at altitude and help your recovery time at altitude so you can get back out on the trail fit and ready for the next day, and day after that. 5). You will be multi-day hiking. Mutli-day training: Getting multi-day training or hiking prior to your Everest base camp is really important the closer you get to your trek. You will be walking and on your feet for many hours at a time with 3 liter of water, down jacket or fleece (depending on the day) Rain gear, snacks, camera, medical kit, valuables and sun cream all adding up to 5kg+ If you haven’t been training with this weight, plus additional weight you are going to get sore leg, back, shoulders and generally feel like crap. You need to get out training on a multi-day basis 6 to 8 weeks prior to you trek. These back to back hikes and training sessions will help your fitness and specific physical conditioning needs to make a safe and enjoyable journey to base camp. You need to manage your time. You have invested the money to do the trek, you have bought all the gear. You need to consider the group you are trekking with and don’t show up unprepared. I don’t want to have to turn you around and send you home because you couldn’t find the time to train. Remember is a potentially life changing journey. You need to respect the mountains, the team you are going with and our team on the ground. So come prepared and make sure you find the time to train and make sure it is the right training. As I always say we are happy to talk you through a specific training plan that will work with your time and the facilities you have available. 6). Get a training plan that works for you. There is no one size fits all training plan. 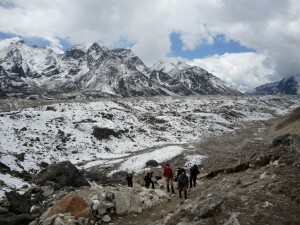 So getting the correct advice for your Everest base camp trekking adventure is really important. Don’t delay. We need to talk to you individually about the best way you can prepare for your trek. You might be living in New York city, Melbourne, Colorado, Hong Kong or Dublin. Where you live and what facilities you have available to you will determine the training program that will work for you. By starting with easier treks like the Inca Trail, or climbing Mt. Toubkal in Morocco you will build your experience for longer treks to higher altitude. If Everest base camp is for you then you need to come prepared. Please don’t show up on one of our treks without having done this prior training. This training advice for Everest base camp treks is tried and tested over the last decade. I have trained numerous people for this trek, climbing Everest and other major peaks. You need to come prepared. Call us, set up a skype call. We want to help you prepare fully for your Everest base camp experience. In the final two months of training before your trip you can add interval training to your weekly training schedule. Ask us for more information and watch this video.